In view of development of super highways and dedicated rail corridors in the north and north east regions, Puzzolana is geared up to meet increasing demand with its newly launched Diesel Electric Crawler units and Sand Washing System. The mobiles are fitted with Caterpillar /Volvo engines both of which are internationally reputed brands with extensive service networks. Radio remote control makes it easy for operators to manoeuvre the machines into position. Feed only (-)2.36 mm sand to Cyclone for better life (less wear) and accurate cut off. Two products, namely Concrete sand & Plaster sand. 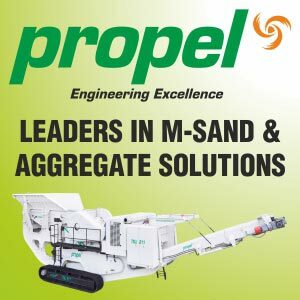 Said Abhijeet Pai, President, Puzzolana Machinery Fabricators, "Though our crushers and screens are well-known in the market, we wanted to draw more focus on them at the tradeshow in view of the rising demand for sand and good quality aggregates. We launched our Mobile Vertical Shaft Impactor PTV 840, which is the first of its kind in India, and displayed our Mobile Jaw PTJ 1176 and Mobile Cone PTC 1125. A combination of these crushers with our Mobile Screen PTS 1552-3 can produce 250 TPH capacity aggregate required for the road construction industry. We have received overwhelming response from our customers and visititors for this innovation."